Accessibility and Inclusivity at Museums and Historic Sites is an AASLH Continuing Education recorded webinar. This webinar is about how museums and historic sites can create inclusive programming and educational experiences for history lovers of all ages and abilities. This event is presented by Katie Stringer Clary. Accessibility and Inclusivity at Museums and Historic Sites is an AASLH Continuing Education recorded webinar. This webinar is about how museums and historic sites can create inclusive programming and educational experiences for history lovers of all ages and abilities. This event is presented by Katie Stringer Clary. Conversations about inclusivity and accessibility have become common place within the museum community. Issues of inclusivity can take account of a variety of audiences with special needs: those with mobility limitations, deaf/hearing impaired, blind/visually impaired, developmental, cognitive, or learning disabilities, and on the autism spectrum. As many museums have realized over the past two decades, people with special needs are an important audience; one that should not be ignored. But how can museums and historic sites make their programming and interpretative goals inclusive to those groups? And how can we be more purposeful in our efforts to better serve everyone in our communities? Join AASLH and Katie Stringer Clary in a conversation on how museums and historic sites can create inclusive programming and educational experiences for history lovers of all ages and abilities. Going beyond basic ADA compliance, this webinar will provide examples and strategies for cultural organizations to be better stewards of history and accessible to diverse audiences. About the Speaker: Dr. Katie Stringer Clary currently teaches history and public history at Coastal Carolina University in Conway, South Carolina. Since 2007, Dr. Clary has worked with museums in various capacities from docent to executive director. In her time at museums and as a graduate student in Public History she focused on museum education and inclusion, especially for people with special needs. This research culminated in her 2014 manuscript, Programming for People with Special Needs: A Guide for Museums and Historic Sites. She followed this with a chapter “Accessibility in Museum Learning” in Museum Learning, 2nd Ed. edited by Barry Lord and Brad King in 2015. Through her work, she continues to advocate for accessibility equality in museums and historic sites and presented as a discussant in a ongoing working group on this topic at the National Council for Public History in March of 2016. Advocating for Collections Care Both Internally and Externally is an AASLH Continuing Education recorded webinar. This webinar is about incorporating information about preservation into all institutional advocacy efforts. This event is presented by Laura Hortz Stanton and Jennifer Ortiz, and is part of the 2018 Online Conference recordings. This session will explore routes for both external and internal advocacy with a focus on collections care, securing time and funding for preservation initiatives and conservation treatment, and will discuss opportunities for incorporating information about preservation into all institutional advocacy efforts. This webinar was recorded as part of the 2018 Online Conference for the Annual Meeting in Kansas City, MO. Recorded Webinar: Are You Ready for Volunteers? Are You Ready for Volunteers? is an AASLH Continuing Education recorded webinar. This webinar is about how to plan for a volunteer program at your history organization or how to improve the program that you currently have. This event is presented by Bethany Hawkins. Are You Ready for Volunteers? 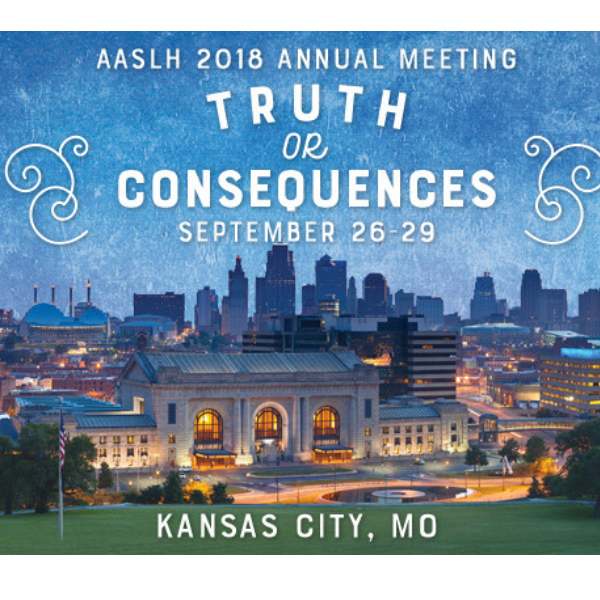 is an AASLH Continuing Education recorded webinar. This webinar is about how to plan for a volunteer program at your history organization or how to improve the program that you currently have. This event is presented by Bethany Hawkins. Many volunteer programs have existed with little or no formal processes and assessments in place. Often, there is no paid staff member who manages the volunteer program. The result is that the programs are often not well run, translating into high volunteer turnover, anemic buy-in from the organization's management and staff, and ultimately, low program success. This webinar will address how to plan for a volunteer program at your history organization or how to improve the program that you currently have. Are You Ready for Volunteers? is an AASLH Continuing Education recorded webinar. This webinar is about how to plan for a volunteer program at your history organization or how to improve the program that you currently have. Are You Ready for Volunteers? is an AASLH Continuing Education recorded webinar. This webinar is about how to plan for a volunteer program at your history organization or how to improve the program that you currently have. Many volunteer programs have existed with little or no formal processes and assessments in place. Often, there is no paid staff member who manages the volunteer program. The result is that the programs are often not well run, translating into high volunteer turnover, anemic buy-in from the organization’s management and staff, and ultimately, low program success. This webinar will address how to plan for a volunteer program at your history organization or how to improve the program that you currently have. Best Practices for Developing History Internships is an AASLH Continuing Education recorded webinar. This webinar is about tips and strategies for creating an internship program that both you and your interns will get something out of. Best Practices for Developing History Internships is an AASLH Continuing Education recorded webinar. This webinar is about tips and strategies for creating an internship program that both you and your interns will get something out of. Creating an internship program at your historic site can not only benefit your organization, but should also benefit your interns and lets you help develop the next generation of history professionals. We’ll cover the ethics of internships, best practices for managing interns, and a look at some common challenges and possible solutions. You’ll leave with ideas you can use at every organization, no matter its size. Beyond the Mansion: Creating Bottom-Up Interpretation from Top-Down Narratives is an AASLH Continuing Education webinar recorded on June 6, 2018. This webinar is about creating bottom-up interpretation from top-down narratives. It is presented by Dr. Ashley Bouknight of Andrew Jackson's Hermitage in Nashville, TN. Have you ever visited a site that has a documented history of slavery, but only been told the stories of the white slave-owners who lived there? Do you work at a site like this? The choice we make about the stories we share, or omit, as interpreters and history practitioners, tells its own story. Do you know which narratives you are reinforcing or omitting in your work? In this webinar, Dr. Ashley Bouknight will share her experience of modifying her site’s mansion tour to create a specialized walking tour focused on the enslaved community. The session will focus on how to gain buy-in for new programs from your institution. Participants will learn about the challenges and triumphs involved in creating bottom-up interpretation from top-down narratives, which they can scale to their own efforts. For many people working in the history field, budgeting was not part of their training nor is it in their comfort zone. But financially sustainable history organizations do not happen by chance—it takes planning and regular attention to budgeting. This 90-minute webinar provides an introduction to budget/financial literacy with guest instructor Becky Beaulieu, author of Financial Fundamentals for Historic House Museums (Rowman & Littlefield, 2017). 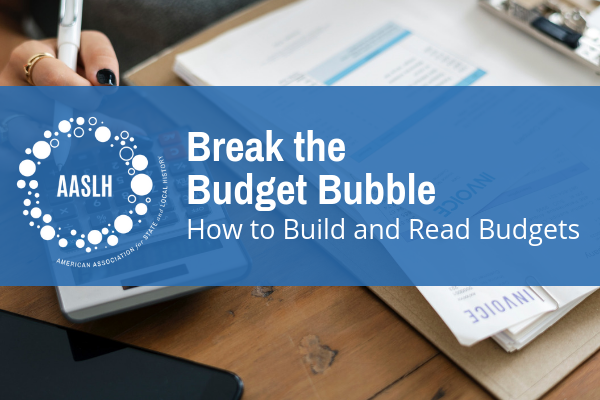 Becky will discuss basic terminology including types of budgets, income, and expenses along with how to create and evaluate a budget so you can prepare for informed and cyclical budget planning. Join us for this valuable lesson on budgeting that will prove useful for years to come. This webinar is part of the StEPs Lab series of online continuing education offered to both StEPs program participants and all others interested in financial management. This is StEPs Lab 16. Be aware of museum standards related to budgeting and steps their organization can take to meet those standards. Rebekah Beaulieu, Ph.D. is the Director of Florence Griswold Museum, an art museum, National Landmark historic house, and thirteen acres of gardens and grounds in Old Lyme, Connecticut. Becky is on the boards of the New England Museum Association and Connecticut Humanities, on the faculty of AASLH’s History Leadership Institute, and a member of the AASLH Finance Committee. She is an AAM Accreditation Commissioner and board member for the AAM Historic Houses and Sites Professional Network. Bringing the Past to the Present Contemporary Issues at Historic Sites & Museums is an AASLH Continuing Education recorded webinar. This webinar is about how historic sites and museums can bring contemporary issues to light at their sites. This event is presented by Lauren Zalut and Annie Anderson. Bringing the Past to the Present Contemporary Issues at Historic Sites & Museums is an AASLH Continuing Education recorded webinar. This webinar is about how historic sites and museums can bring contemporary issues to light at their sites. This event is presented by Lauren Zalut and Annie Anderson. Are you interested in connecting your site’s history with a current issue? Or wondering how you can use your site to spark dialogue and encourage visitors to take action? Or to navigate sensitive conversations with co-workers and visitors who might be resistant to discussing contemporary topics? This interactive webinar will explore how historic sites and museums can bring contemporary issues to light at their sites. Using Eastern State Penitentiary Historic Site as a case study, speakers Lauren Zalut and Annie Anderson will discuss their work linking the past and the present through the stories of incarceration. The presenters will discuss their site’s progression from solely interpreting the past to interpreting both historic and current events. They will also provide participants with a toolkit of actionable steps and resources that can be scaled up or down, depending on the size of each participant’s site. 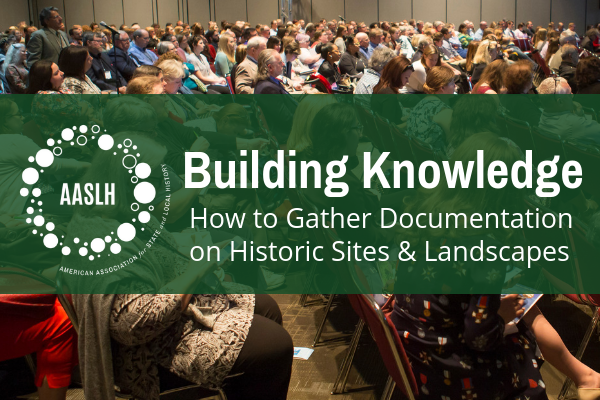 Building Knowledge: Documentation on Historic Sites and Landscapes is an AASLH Continuing Education recorded webinar. This webinar is about the various reports and documents that organizations will want to compile and keep on the historic structures and landscapes they own or manage. This event is presented by Rachel Leibowitz. This webinar is part of the StEPs Lab series of continuing education offered to both StEPs program participants and all others interested in historic preservation. This is StEPs Lab 4. Building Knowledge: Documentation on Historic Sites and Landscapes is an AASLH Continuing Education recorded webinar. This webinar is about the various reports and documents that organizations will want to compile and keep on the historic structures and landscapes they own or manage. This event is presented by Rachel Leibowitz. If it’s true that “knowledge is power,” then organizations that own or manage historic structures and landscapes need all the knowledge they can get. In this StEPs Lab webinar, we discuss the various reports and documents that organizations will want to compile and keep on the historic structures and landscapes they own or manage. Hear guest speaker Rachel Leibowitz, Illinois Historic Preservation Agency, discuss how to find someone to research and write Historic Structures and other reports, existing studies you may not be aware of, and the types of information that can be gleaned from these documents. Leibowitz is the Manager of the Preservation Services Division of the Illinois Historic Preservation Agency and the Deputy State Historic Preservation Officer. She has served as a historian for Federal Programs at the Texas Historical Commission in Austin, and also has worked in two Chicago architecture firms and in the City of Chicago’s Historic Preservation Division. Leibowitz has taught courses in cultural landscape preservation and landscape history at the University of Texas at Austin and at the University of Illinois at Urbana-Champaign. Paid and unpaid staff, volunteers, and board members from organizations of all sizes will benefit from this recording. Participants enrolled in AASLH’s StEPs program will benefit from a discussion on how they can meet performance indicators related to the topic. This webinar is part of the StEPs Lab series of continuing education offered to both StEPs program participants and all others interested in historic preservation. This is StEPs Lab 4. How do you care for an historic cemetery? This AASLH webinar, presented by Jason Church, addresses the most important and pressing issues to be addressed in basic care of historic cemeteries. This webinar will cover the basic steps of caring for historic cemeteries. Topics covered include an introduction to documentation surveys and forms, and an overview of general definitions required for documentation, photography tips, and an introduction to preservation planning and prioritization. Also covered will be basic tips for cleaning of stone monuments. After the presentation, there will be ample time for questions and answers. Participants will understand the first steps to preservation planning and prioritization of an historic cemetery. Participants will feel prepared to document an historic cemetery. Participants will be equipped to take basic steps to care for an historic cemetery. Jason Church is a Materials Conservator in the Materials Conservation Program at the National Center for Preservation Technology and Training (National Park Service). Jason divides his time between conducting in-house research, organizing various training events, and teaching hands-on conservation workshops. Since 2005 he has conducted more than 100 lectures and hands-on training for cemetery conservation. He earned his M.F.A. in Historic Preservation from Savannah College of Art and Design.